What happened here? 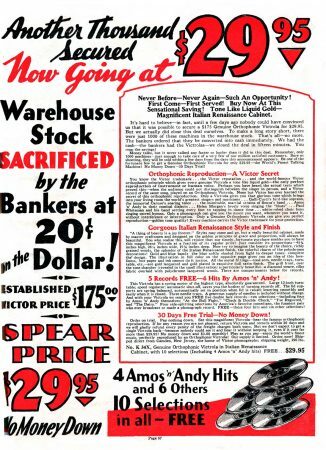 The pages from this 1932 Spear catalog are absolutely accurate – they really ARE selling a $175 top-of-the-line phonograph for 30 bucks. Victor Orthophonic phonographs were the absolute finest machines of their day, and priced to match. They were the models people dreamed of – like owning like the latest Apple iPhone today. 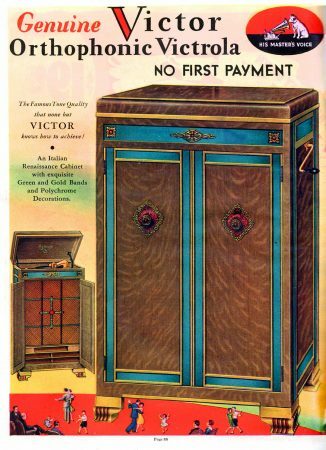 Introduced in 1925, Victor Orthophonics offered the ultimate in sound quality for a completely acoustic phonograph, using no electricity or electronics. (Just think about that for a moment in this day and age.) 78 rpm records played on a Victor Orthophonic still sound wonderful – loud, full and mellow, and surprisingly listenable, even to modern ears. They were the pinnacle of the acoustic record playing art: you can find people showing them off on Youtube. So why is this Orthophonic VV-8-9 reduced from $175 to under $30 bucks in 1932? A perfect storm of factors. Electrification: These Orthophonic phonographs were ultimate in acoustic research, designed to show off the higher fidelity possible through new electrical recordings with microphones, but they didn’t use electronics themselves. They actually signaled the end of the line for the technology that Edison invented 50 years earlier. Radio: All the electronics were going into radios, which was leaping past records as the exciting new entertainment medium. Instead of buying discs, why, you could just stream music from the airwaves – for free! The Great Depression: Few people wanted to spend on luxury entertainment once the Depression hit. Cheap little radios offered more value for the money than giant console phonographs that had to have records changed every 3 to 4 minutes. 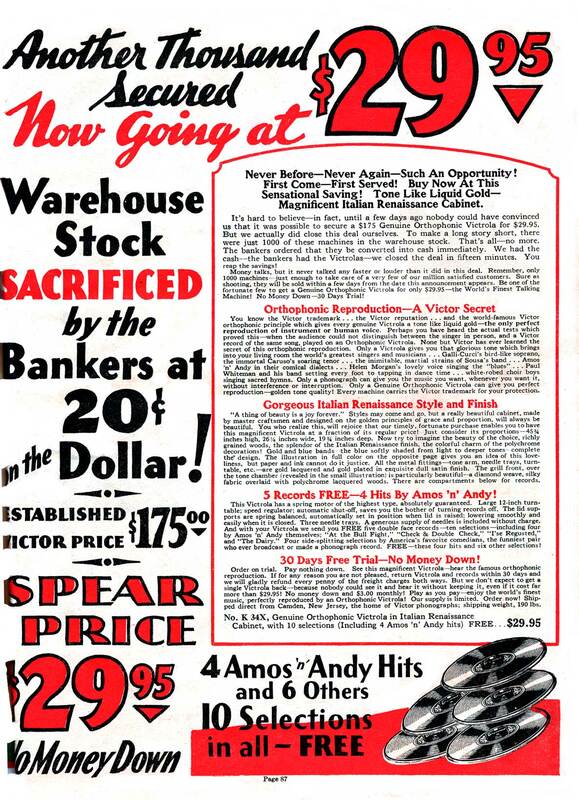 And so it came to pass that the Victor Phonograph Company got purchased but the Radio Company of America in 1929, and the Orthophonic Victrolas of 1928 which never sold had their prices slashed to the bone, and – insult added to injury – even had free records given away to help sales. And who were the recording artists given away? The most popular radio performers of 1932 – Amos ‘n’ Andy.